Some people call them kiosks, interactive displays or even touchscreen deely boppers. Whatever they are called, they’re pretty cool. Almost everyone in our society understands the basics of an interactive display. In 2015 we are overwhelmed with the concept of touching bright flat screens for various uses. Even two-year-olds can be seen at the grocery stores swiping through pictures or tapping on virtual objects. It’s the FUTURE, Future, future. We recently wrote a post about our website design services and if you haven’t read that one, we think you’ll be pleasantly surprised by the way we design for the web. But for now, we’d like to tell you about another service that really brings the “cool” factor. 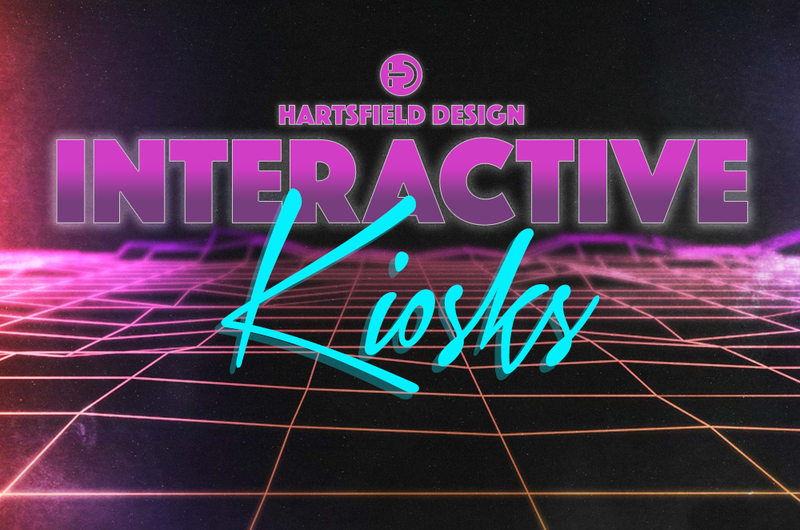 Interactive kiosk design. Basically, they are touch-screen displays that allow users to access content or see multimedia on demand while on location. They are usually mounted to a wall or placed onto a cabinet or stand. Typically kiosks are placed in public spaces in order to engage with an intended audience. The use of an interactive display is really dependent on the need and the creative spirit. Most people that request a kiosk are looking to dynamically enhance a specific environment or space for their customers. Listed below are just a few ways kiosks can be used. Donors can be listed and buttons can be created to view a biography or reason why the donor supports your organization. Nothing says you appreciate your donors more than a public display of their benevolence. We can design a kiosk that visitors can see those honored through your organization. These are great for continuing to honor these people of value. It also acts as a public display of your astute record keeping. Keep your customers informed or entertained while they are in your waiting area or public space. Educate them about who you are, what you do and why it matters. You’d be surprised what they don’t know and more surprised about what you’ve never told them. Do you know that moment when you are talking to a potential customer at your booth and another one or two people show up. You can’t just stop talking and start over. An interactive kiosk gives people multiple ways to get informed at one location. They can be a great supplemental aid while you make valuable connections. Take your exhibit to the next level by providing more variety to your information distribution. Don’t just expect people to get it. Educate them. Even something as basic as a set of videos on an interactive kiosk will make your exhibit more interesting and informative. Users rule. Yes, you have a message or specific intent, but the end-users are the most important point to consider. Your kiosk has to be both engaging and very simple at the same time. It has to be intuitive to a variety of people. And lastly, you always hope it is rewarding. We love what we do and we are really good at it. Come chat with us and see if an interactive kiosk is something that you have been needing. Visit our kiosk page to see examples of some of our projects.